I needed to make a thank you card for my Mom Mom and with Thanksgiving coming up, a Turkey seemed like a great idea! My mom helped with the pattern and I picked out the papers, embellishments and colors and put it all together. It's really simple to make a card like this, one big circle, one oval, rounded and pointed feathers, a funky hat, half circles for wings and bird feet are all stacked together using Aleene's Dry Adhesives. We added a few 3D embellishments for fun. It's easy to make this project your own with a few changes, have fun with it! 1. 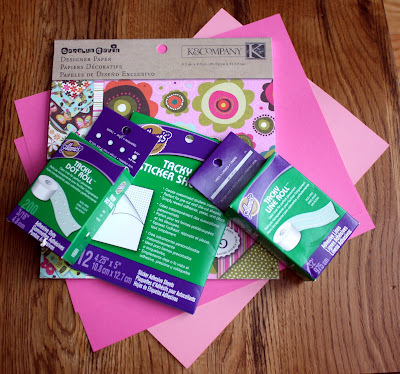 Fold an 8.5x11" sheet of dark pink cardstock in half and crease edge with a bone folder. This is the base card. 2. 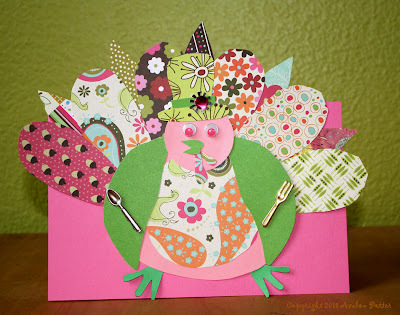 Use circle punch to create light pink card stock turkey head. 3. Fold any paper in half and cut oval body shape, trace this on light pink card stock and cut out. 4. Cut feet out of darker green card stock. 5. Cut hat shape out of patterned paper and make a hat band out of light green card stock. 6. Cut the feathers, there are rounded and pointy feathers, the round go on top and the pointy in between them. Cut beak and wings out of light green card stock and gobbler out of patterned paper. Cut a bib out of patterned paper to fit center of body. 7. Attach the beak and gobbler on face using sticker sheet. Add googly eyes with Tacky Dots. Attach hat to top of head adding hat band with sticker sheet and add embellishments with tacky dots. 8. Attach the bib to the front of the turkey using sticker sheet. Attach wings on either side of bird followed by the head at the top with sticker sheet. 8. Attach feet with sticker sheet. Use Tacky Line Roll to attach silverware. 9. Build feathers around the back of the card using the sticker sheet to attach. Layer the pointy feathers in between the rounded. Attach the turkey to the base card using the sticker sheet.